The Small Amish Made Wishing Well is the perfect accent for your outdoor space. This lovely solid wood well can brighten your yard or garden with its attractive form. Add your favorite flowers in the well bucket and create a wonderful spot to snap pictures of the kids. Use this wooden well as a centerpiece for your next outdoor party. A solid wood wishing well is a great way to provide a landmark for friends and family who are coming to visit your home. 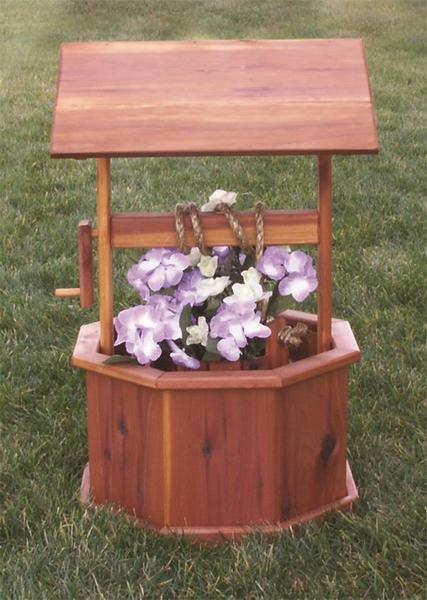 This wishing well is Amish made in America using aromatic red cedar wood. Reap the benefits that red cedar offers for your outdoor furniture collection. Cedar wood naturally resists decay, making it a good candidate for outdoor furniture. The natural scent repels bugs that may try to invade. Cedar offers a durable and long-lasting wood that will remain stylish and strong throughout the years. Cedar wood is an economical choice offered at a great price. Bring home the Small Amish Made Wishing Well today. No assembly required. Handcrafted by the Amish, this outdoor furniture is built to last. Be sure to view the Amish Red Cedar Wood Wishing Well and the Amish Medium Cedar Wishing Well for some larger options. Call us today with any questions. Our toll-free number is 866-272-6773.